Saptashrungi is a site of Hindu pilgrimage situated 60 kilometres (37 mi) from Nashik in west Indian state of Maharashtra in India. According to Hindu traditions, the goddess Saptashrungi Nivasini dwells within the seven mountain peaks. (Sapta means seven and shrung means peaks.) It is located in Nanduri, Kalwan taluka, a small village near Nashik in India. Devotees visit this place in large numbers every day. The temple is also known popularly as one of the “three and half Shakti Peethas” of Maharashtra. Trimbakeshwar or Tryambakeshwar is an ancient Hindu temple in the town of Trimbak, in the Trimbakeshwar tehsil in the Nashik District of Maharashtra, India, 28 km from the city of Nashik and 40 km from nashik road. It is dedicated to the god Shiva and is one of the twelve Jyotirlingas.Kusavarta, a kunda (sacred pond) in the temple premises is the source of the Godavari River, the longest river in peninsular India. The current temple was built by Peshwa Balaji Baji Rao (Nanasaheb). 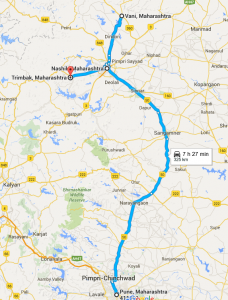 Distance bewteen Pune to Nashik is 220 KM. It takes about 5 and half hours to reach sapta shrungi gad. Vani to Sapta shrungi gad is 22KM. (Halt of 40 mins). Reached pune around 11:45 PM. We started from Hadapsar around 6:40 AM by route mentioned above. Took halt at 8:15 am for breakfast. Went to Trimbekeshwar by 4:30 PM to 6:30 PM. Started around 6 PM and took halt for dinner 9 – 10 PM. Reached Pune at 11:45 PM. 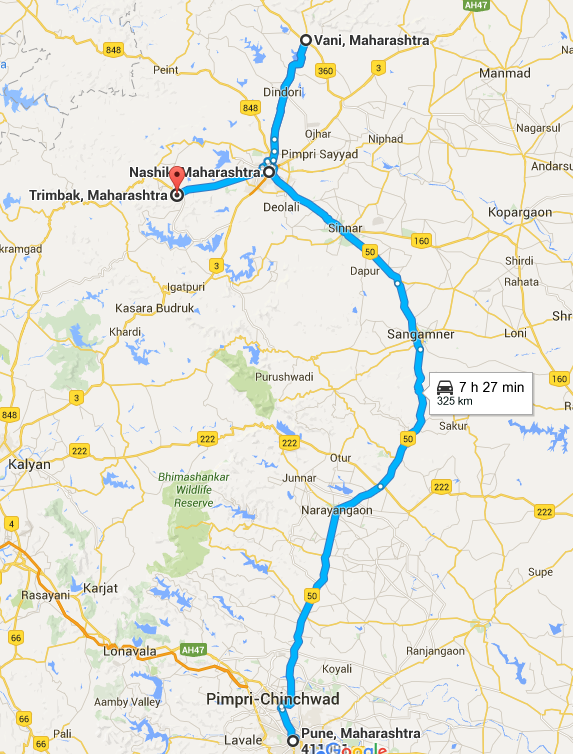 -Pune Nashik road is 1 lane highway so overtaking is difficult especially in small cars. -If you plan to go on some occasion/festival or long weekend, you can expect rush and traffic jams.